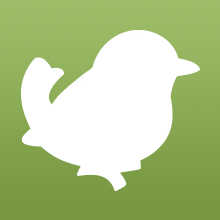 For 19 days we're adding a new Birdorable bird every day as part of our Birdorable Bonanza 2011. We're counting up to revealing our 350th species! Today's bird is the Red Knot. Red Knots are widespread shorebirds known for their long-distance migration. They breed across tundra habitat in Canada, Europe and Russia; winters are spent along coastal Africa and South America, among others. Red Knots in the Americas are known to rely on horseshoe crab eggs as an important nutrition source during their northward migration. 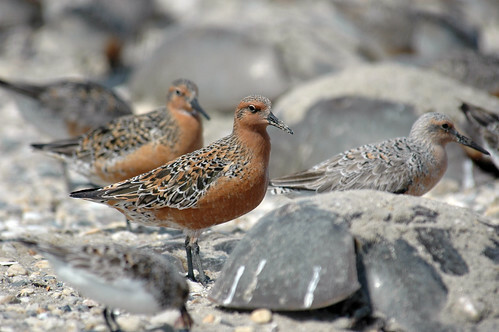 Excessive crab harvesting in recent decades has contributed to the rapid decline of the American Red Knot subspecies, which are currently considered endangered. Tomorrow's bird is a small migratory bird that in summer has a yellow and black head with a bright orange throat. Can you guess what it will be? 2 comments on "Bonanza Bird #5: Red Knot"
You know about B95? He's a Rufa red knot.